NYC, 02/06/2019, 5:00PM. 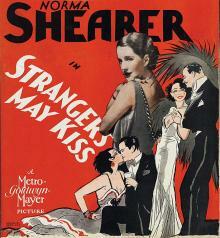 Strangers May Kiss (1931): Pre-code drama starring Norma Shearer. Against her friends wishes, Lisbeth moves to Mexico to live with her lover. Starring Norma Shearer, Robert Montgomery, Neil Hamilton. Pre-Code refers to the brief era in the American film industry between the widespread adoption of sound in pictures in 1929 and the enforcement of the Motion Picture Production Code censorship guidelines, popularly known as the "Hays Code", in mid-1934.